The first neurology training in Zambia launched in Zambia, a collaborative initiative brought about by multiple academic medical centers in the US and the National Institute of Neurological Disorders and Stroke. Until recently, Zambia — a country with roughly 16 million people — did not have a single locally-trained, full-time neurologist. As of October, thanks to a multi-institutional international effort and the launch of the first neurology training program in the country, there is hope for improving that ratio for the foreseeable future. The initiative was spearheaded by Omar Siddiqi, MD, MPH, an assistant professor of neurology at Beth Israel Deaconess Medical Center and global health researcher, who initially came to Zambia in 2005 during his neurology residency with the help of Gretchen Birbeck, MD, MPH, who already had a long-standing research program in the country. At that time, Igor Koralnik, MD, now the chairperson of the department of neurological sciences and head of the section of neuroinfectious diseases at Rush University Medical Center, became Dr. Siddiqi's mentor. Dr. Siddiqi and his colleagues understood that the “game changer” would have to be a local neurology training program that would ensure a consistent output of Zambian neurologists, who would continue to train future generations. The new program is “the culmination of about 13 years of work. It was made possible by the fact that there was one neurologist in Zambia already, Dr. Masharip Atadzhanov, who came from the former Soviet Union and who had been there for a while — and the connection that we had with him through Gretchen Birbeck,” Dr. Koralnik said. Dr. Birbeck, Rykenboer professor of neurology and research director for the Strong Epilepsy Center at the University of Rochester Medical Center, has been involved in the work in Zambia for many years. In 2015, Dr. Siddiqi had discussed the idea for the training program with Drs. Koralnik and Birbeck and began fundraising efforts. Then, when he met Deanna Saylor, MD, assistant professor of neurology and director of the Hopkins Global Neurology Program at Johns Hopkins University School of Medicine, everything started to come together. Dr. Saylor was interested in writing the curriculum with Dr. Siddiqi and became the program's training director. Dr. Saylor received a Fulbright Scholar Award from the US Department of State and was able to move to Zambia with her husband and two children full time in February 2018. In October 2018, finally, there was cause for celebration. The neurology residency program was officially launched at a Neurosciences Symposium at UTH in Lusaka. Daniel Foote, the US ambassador in Zambia, gave the keynote address. “We have a community and a department,” Dr. Siddiqi said. In the past, neurology residents would come through for a month and they'd really make a huge difference, but it wasn't sustained, he continued. “Now, we have this service and neurology patients are being seen every day and they are being followed up. They have advocates who are within the system who can speak the same language, so it is just a whole other level,” he said. This is all possible, he said, thanks to multiple academic institutions in the US, including Harvard, Johns Hopkins, University of Rochester, University, Michigan State, and a number of others, as well as research grant support from the US Government and the National Institute of Neurological Disorders and Stroke. Clearly, the stakes are high. “There is a huge unmet need in Zambia for every aspect of neurology — communicable and noncommunicable disease,” Dr. Koralnik told Neurology Today. There's a tremendous problem, for example, with blood pressure and very high rates of hemorrhagic stroke, the neurologists noted, in part because the diet in Zambia is very high in salt. This is one area where local neurologists, who know the dietary practices firsthand, can really make a difference in teaching patients about prevention. The clinicians also reported a lot of neurologic complications of HIV, such as meningitis, encephalitis, neuropathy, as well as diseases related to malnutrition, cerebral malaria, epilepsy, and other conditions that have to do with the resource-limited setting. There is also a lot of fear around lumbar puncture, both Dr. Koralnik and Dr. Siddiqi pointed out. Often patients who have come to the hospital too late or are already too sick to respond to treatment will die after a lumbar puncture, so the association has misled many individuals to equate the two. “We've opened the didactic sessions to the internal medicine residents, and a lot of them have been attending our neurology educational sessions too. So even though we're only training five neurologists right now, I think that we're improving the baseline neurological knowledge among a lot of different health care providers,” Dr. Saylor said. The bulk of neurological care is still going to come from non-neurologists in Zambia in the near future because of sheer numbers, she added, so this is already making a difference. “We're very enthusiastic about the future,” he said. “There's a tremendous amount of energy that's been put into this, and it's a celebration of many years of hard work to get to the point where we're starting to train. It's something very unique to be able to train the first group of neurology trainees in a country like this,” said Dr. Koralnik. In-country training should always be the goal of a global neurology program, Dr. Siddiqi said. “If it's not your goal, then the program is so vulnerable to when you leave. If you leave and nothing is left behind, you really haven't accomplished what I think everyone wants, which is something to be sustained,” Dr. Siddiqi said. 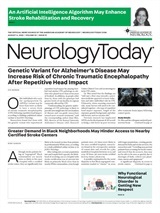 Neurology Today18(22):58-60, November 15, 2018.